Authentically designed for your favorite player, the Lacrosse kit personalized Christmas ornament features lifelike equipment that looks ready to put on and hit the field with. These sports ornaments personalized as fun mementos of the season include the player's name and year along with a number and team name at your option. 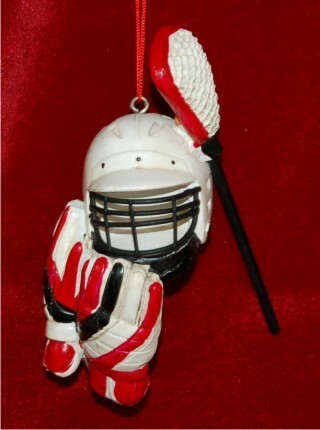 It is one of several lacrosse ornaments personalized by hand that we offer, so you'll find just the right one for each player on your list - or you can put together several to create a cool theme. The great-looking lacrosse equipment personalized Christmas ornament will score points with your recipient when you give it to them in our plush velvet drawstring bag.